When I went to look at my CTSW from the Gutmans, They told me that this was one of the fastest CT's they have every flown, Knowing that they are salesmen, I figured this was something they say to all prospective buyers. They stated, " it walked away from (other) CT's that they have flown." I have been very impressed with the performance of this plane, at 5100 rpm I regularly see 127 KIAS at 2000 to 3000 MSL, Today on a trip at 8,500 showed 118 KIAS at 5100rpm with a true of 130 Knots, That matched exactly with my calculated true speed I predicted during flight planning. This also matched the ground speed on the GPS with the headwind factored in. What kind of performance is everyone else seeing? I know Ed Cesnalis states he show 127 knots regularly, Is this truly an outlier? Or is everyone else seeing this kind of performance? Where was the leak? This aircraft had pitot static check less than 50 hours ago. Is there an "acceptable" leak that would fall this amount of error? What many are missing here is prop pitch and WOT rpm. prop pitch plays a tremendous part here. If you're only pitched to get 5300-5400 rpm WOT then one that is pitched at 5600-5650 will walk away. Trimming properly is another consideration. Cross controlling even a little slows things down. It may be small enough you don't even notice. Flap settings can be different from plane to plane. Instruments don't always tell the truth. I wouldn't worry about a few knots of speed and just enjoy the flying experience. You overstated my claims a little. 127kts true is my top speed. My speeds range from 118 to 127 and prolly average 122. You are not going 130kts at 5,100 RPM. Our airframe / powerplants aren't capable of 118lts IAS @ 8,500' @ 5,500 RPM. AT 5,100 RPM its not even close even with an optimized prop pitch. The easy way to know your speed is overstated is to consider you can't go a lot faster than everyone else at a very low power setting. I agree that this sounds unlikely, and possibly this one instance was an anomaly, the odd part is that my GPS ground speed generally matches my true airspeed when corrected for headwind component. Airspeed numbers on the CT can be artificially high for a number of reasons from leaks in the static system to orientation of the static port. Headwind numbers on the Dynon are computed based on the same numbers you are using to figure ground speed. The Dynons are notorious for being inaccurate. You need to fly a speed triangle or box and figure your true average groundspeed based off the GPS. That makes sense, and I will do that test. FWIW I was comparing the Dynon numbers with the winds aloft charts and they were within 10% I will plot a course in the GPS and set up the experiment as described. Variance is likely, but that is a lot of difference. I can't really see 130KTAS @ 5100rpm happening on just 100hp in a CT.
My plane (LSi) weighs 830. I have the "tundra" wheels/fairings and I fly the plane mostly at 4,600 rpm. Travel speed is about 96-100 kts. If I notch it up to 5,100 rpm the plane will go about 110-117 kts. I do pay attention to trim so as not to cross control. The longest cross country I have flown is only 50 minutes, and, I have never tried to optimize the prop pitch, etc... all stock. Headed right to the airport after work today, Using Doug Gray's method for determining true air speed based on GPS ground speed. Used the excel file available online, the math looked sound, and looks like a largely accepted method for doing this experiment. I also noted the dynon read out of TAS and the 30 sec intervals, and interestingly it showed 4.5 knots faster at the 5100 rpm, and 2.1 knots faster at 5400 rpm. Maybe something to do with the prop wash over the static port at the higher RPM? Regardless, I am impressed with this, and I am glad I did this test. and i can confidently say that my true airspeed is 126 ±1.3 knots at 5100 rpm and 128±1.3 knots at 5400 rpm. This also shows the cost/ benefit of sucking down another half gallon/hour for 2 knots. FWIW, the latest W&B in my plane states 749lbs. 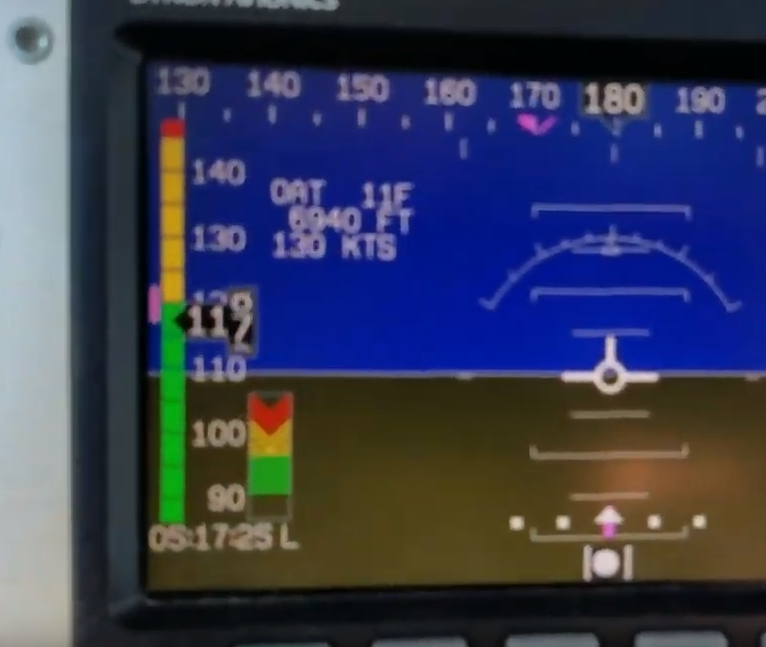 What is your WOT RPM in level flight at 7,500'? I dunno, Never tried it. Set throttle at wide open. Until you determine your WOT RPM you cannot accesse how well or badly your prop pitch is optimized. You did a speed test at 8,000'. Best speed happens at 7,500 DA so do this for that altitude or higher unless you don't actually fly that high. Until your prop pitch is optimized you will likely have less than 90% power available. The idea that you are that fast at 5,100 RPM (which is a low cruise power setting) and without an optimized prop pitch is even less likely. Check your tach against an optical prop tach, I bet your RPM is reading lower than it actually is. Either that or you got the best 912 engine Rotax ever produced, making significantly more than 100hp. If so, good on ya! I will check it out this weekend, One point to note is that when I cruise, I put the flaps in the "manual" mode which allows for what I am guessing is 2°-4° extra of reflex. I will confirm the extra reflex angle too. Too much reflex will cause loss of speed. Been there and tested it. 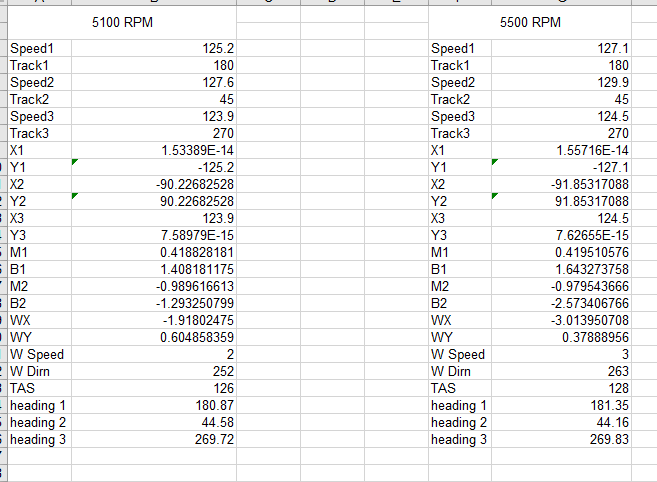 Your only 5500 rpm WOT max is costing you climb and especially with the Warp. At your flight and take off altitudes you'd be better at 5600-5650 and then pulling throttle back to 5500 in cruise. Remember that you fly higher on an everyday basis than 99% of the other CT's and your numbers will be different at times compared to their cruising around 3500 -7500. I can substitute a course deviation if I lack climb but there's no substitute for slow! You also lose a tad of cruise to, but mostly climb performance for you. 14 different props, 4 CTSW's and 4 months of testing proved it out. You can claim what you want and since we can only be optimized for one altitude your claim will sometimes be true. It is very hard for me to see how I am losing cruise performance when I am selecting 'all available power' instead of throttling back 150 RPM. Your plane may go faster when you throttle back, I don't know but my goes fastest at wide open throttle. Because it is easier for the engine to develop power with the slightly flatter pitch. Your so high you struggle for power. 5500 isn't over pitched, but the engine is trying to develop torque and HP to make it work.If I stretch your arm out straight it isn't broke and can lift so much weight and produce so much power. Let you bend the arm half way and it's easier to lift weight and develop more muscle power. At your altitude you need every edge you can get. You'll never know if you never try it. Right now all it is is conjecture and Rotax charts don't apply because those are using CS props not ground adjustable. Rodger, That makes sense due to the fact at some point the flap will turn into a spoiler. Since you have done the testing, can you provide the empirical data showing at what degree of reflex is ideal for least amount of drag? Do you have data for the combinations you tested? Obviously, WOT speed is going to be constrained by the operating limitations of the engine. 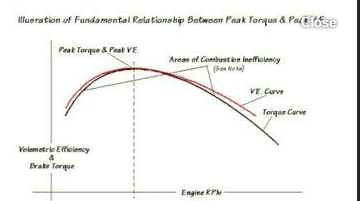 Since Va is effected by density altitude, and peak torque follows peak VE, this would scale back the toque curve of the above graph. or lower the RPM where peak torque happens. This is mathematically known because VE is always higher than the torque curve to the left and right of where they meet. 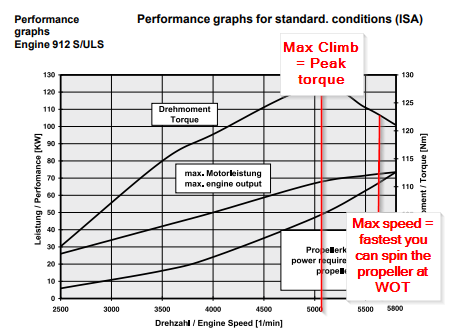 Since or propellers are fixed(in flight) it would stand to reason, that max speed would happen 5800 rpm at full throttle, and wherever your prop of choice is pitched to achieve that, climb performance will be a function of propeller efficiency and where that ended up along to torque curve. 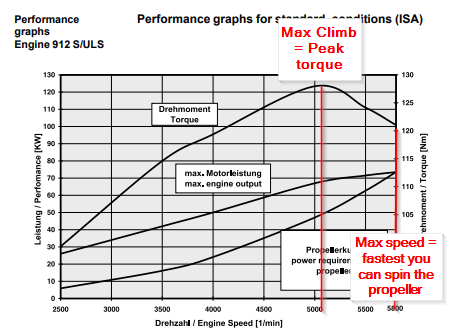 This stands to reason that since we see ≈4800-5000 rpm at max climb,(below peak torque) a variable pitched prop would be a great benefit for climb performance. I believe that Ed may be on to something operating at high density altitudes, as the lower RPM's for him would account for optimized use of the power band he has available. Roger, my engine doesn't have to struggle for power because of my altitude, that's silly. My engine will smoothly deliver power at any RPM I select by pitching my prop and setting my throttle, there is no struggle involved. There is a power reduction that corresponds to the lesser available O2 at my high altitude, but again no struggle. I don't have to try it, I already know. If I set to 5,650, then when I complied with the five minute limitation by retarding my throttle I would slow down. End of story, slower can't be fastest. Reducing RPM by 150 is a very large reduction, you are not very close to top speed like this. Really interesting thread and timely for me. Bring a new CTSW owner I'm currently trying to baseline aircraft performance to enter into Skydemon (like a European Foreflight). Did a couple of runs yesterday, 7 degrees (C) at 1800ft asl, -12 degrees of flap. 4400 rpm is 110knts IAS. 4800 rpm is 122knts IAS. Totally non scientific, just me buzzing around the sky straight and level, no triangles etc.